In an attempt to minimise building damage caused by flooding, backflow devices have been installed in various parts of inner city Brisbane. Over a four year period, Lord Mayor Graham Quirk is set to inject $10 million into the project. Backflow devices have already been installed in various streets in the Brisbane CBD, and suburbs Milton and Chelmer, with many more installations scheduled. Once attached to stormwater systems the backflow devices allow water to exit, yet not re-enter the pipes. This helps to ensure that excess water remains in the stormwater systems and eventually goes out to sea, rather than spilling out into local streets. In a Brisbane Times article, Quirk is quick to highlight that the backflow devices are designed to protect properties from backflow flooding caused by small scale floods. “This four-year program will reduce the risk of backflow flooding for about 80 per cent of properties impacted in 2011 once complete,” he explains. Apart from backflow devices, submersible water pumps are incredibly handy following small scale flooding episodes. PSA2 2in submersible water pumps from Wacker Neuson are perfect for all dewatering needs, as they can effectively remove excess ground or surface water from backyards, roads, sporting fields and so forth. 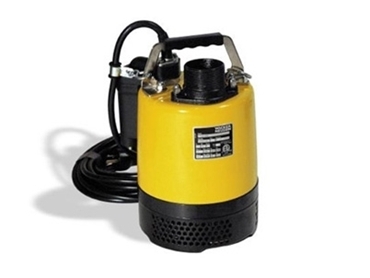 The submersible water pumps are lightweight and portable, which makes them easy to transport from one area to another. A lubricated oil filter helps to ensure the submersible water pumps do not overheat, while built in thermal protection minimises motor damage. This guarantees operational efficiency and cuts maintenance costs, which ensures excess water is removed as quickly as possible, and the potential for water damage is greatly minimised. A lip seal is designed to protect the mechanical seal from any debris that are present in the excess water, which further minimises damage. By using submersible water pumps to effectively and efficiently controll small scale floods, the potential damage they cause can be prevented or minimised with ease.